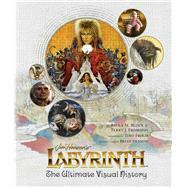 Journey back to Jim Henson's Labyrinth in this visually stunning celebration of the enchanting fantasy classic. Paula M. Block is the coauthor of the novella Star Trek: Deep Space Nine—Lust’s Latinum Lost and numerous nonfiction books about the entertainment industry, including Star Trek: The Original Series 365, Star Trek 101, Monk: The Official Episode Guide, The 4400 Companion, Star Trek: Deep Space Nine Companion, The Secrets of Star Trek Insurrection, Star Trek: Action!, and The Magic of Tribbles. She is also the coeditor of Pocket Books’ popular short story series Star Trek: Strange New Worlds. She has been a columnist for the Chicago Sun-Times, the Midwest correspondent for Biotechnology Newswatch, and the international editor for Chemical Week. After nineteen years overseeing and editing licensed publishing for Paramount Pictures and CBS Television, Paula moved to Southern Oregon, where she and her husband, author Terry J. Erdmann, write a monthly entertainment column for The Jacksonville Review. Terry J. Erdmann is the coauthor of the novella Star Trek: Deep Space Nine—Lust’s Latinum Lost and numerous nonfiction books about the entertainment industry, including Star Trek: The Original Series 365, Star Trek 101, Monk: The Official Episode Guide, The Last Samurai Official Companion, Star Trek: Deep Space Nine Companion, The Secrets of Star Trek Insurrection, The Magic of Tribbles, The Tribble Handbook, Star Trek: Action!, and The 4400 Companion. As a motion picture publicist, he helped to create the marketing campaigns for dozens of films, from Cocoon, Aliens, and Willow, to What’s Love Got to Do With It, Father of the Bride Part II, G.I. Jane, and Star Trek V: The Final Frontier. He lives in Southern Oregon, where he and his wife, author Paula M. Block, write a monthly entertainment column for The Jacksonville Review. Toby Froud is a puppet designer and fabricator. He began his life as Baby Toby in the film Labyrinth and is currently a puppet sculptor at the stop-motion company Laika, where he has worked on ParaNorman, The Boxtrolls, and the upcoming Kubo and the Two Strings. He lives in Portland, Oregon, with his wife and son. Brian Henson is Chairman of The Jim Henson Company and an Oscar and Emmy Award-winning technological innovator. He is also an award-winning director, producer, writer and puppeteer for film and television. He lives in Southern California.